You’ve seen a wasp, you’ve seen another, and might think they all look the same, however it seems that among wasps, at least, the one hive mind doesn’t apply to appearances as well, as a new study shows that paper wasps developed the ability to recognize each other’s faces, just like humans. Individuals of a species have learned to identify its kin through various means, the most prevailing of which is face recognition, and for humans at least, this is a highly important part that has its own set of patterns in the brain. “Studies show that when you look at a face, your brain treats it in a totally different way than it does other images,” Sheehan said. Scientists at the University of Michigan studied the Polistes fuscatus species of paper wasp, which have extremely variable facial patterns. The particular species of wasps have a brain less than one-millionth the size of a human’s, as well lacking many visual regions of the brain, however despite all this, they’re more than able to differentiate the faces of their kind. For their study, Michael Sheehan and Elizabeth Tibbetts, tested two wasp species, P. fuscatusand P. metricus, the later of which has a much less complex social structure, through a T-shaped maze. On each side of the “T” arm an image of a wasp’s face was put, and if the maze wasp chose the right side they’d receive a reward, which in this case was a safe zone. 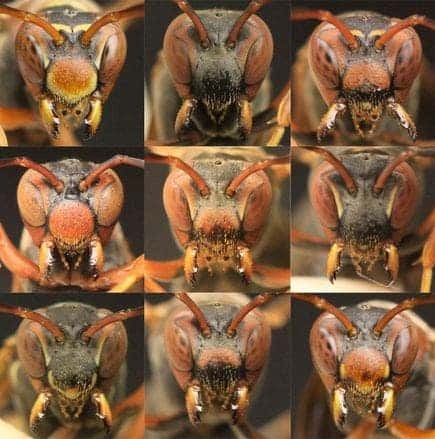 The experiment was repeated several times with image placement interchanged each time, at which time the researchers observed that the wasps were able to choose the safe zone most of time, simply by recognizing the wasp face. To test this assumption, the researchers introduced simple images with shapes, instead of wasp faces. They found that the wasps learned far more slowly and not as well when faces weren’t involved, enforcing the claim that they have a special face recognition ability. These results were observed for the P. fuscatus, for the P. metricus things were a lot different. For one, P. metricus wasps basically all look the same and have shown extremely poor face recognition response. Why such a huge discrepancy between the two? Sheehan says that the P. fuscatus multicolony social structure is the most likely cause. “They have multiple queens and they all want to reproduce—they all want to be the most dominant. So being able to recognize each other helps them understand who’s already beaten who, who has higher ranking in the hierarchy, and this helps to keep the peace. The researchers suggests that the paper wasps’ brains are tuned to recognize faces of their own species, as with humans.